European Private International Law serves the European idea of an area of freedom, security and justice. For that task, it seems crucial that the legal actors of European Private International Law address its fundamentals. 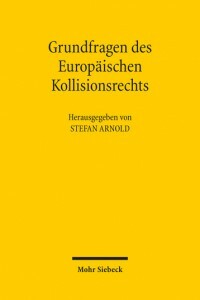 The fundamentals – or fundamental questions – of European Private International Law are manifold. Some of them are discussed in this volume. They concern the political framework within which European Law operates, the challenges of modern concepts of “family” or the relationship of Private International Law and Religious Law. Last not least, European Private International Law needs to ascertain the regulatory function of central Conflict of Laws concepts such as the idea of connecting factors, party autonomy, ordre public and renvoi.